This antibody recognizes TRAcP (isoforms 5a and 5b). Serum TRAcP 5a is secreted by macrophages and dendritic cells and increased in many patients of rheumatoid arthritis. HepG2, 293T, K562 or RPMI-8226 Cells. Spleen from Hairy Cell Leukemia (HCL) patient. 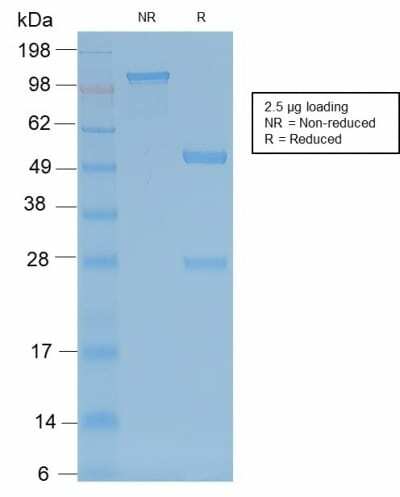 This antibody recognizes a protein of 35 kDa, which is identified as tartrate-resistant acid phosphatase (TRAcP). It exists as two isoforms (5a and 5b). This MAb reacts with both the isoforms. Serum TRAcP 5a is secreted by macrophages and dendritic cells and increased in many patients of rheumatoid arthritis. Serum TRAcP 5b is produced from osteoclasts and elevated during bone resorption. TRAcP is an iron containing glycoprotein, which catalyzes the conversion of orthophosphoric monoester to alcohol and orthophosphate. It is the most basic of the acid phosphatases and is the only form not inhibited by L( )-tartrate. TRAcP is synthesized as a latent proenzyme and is activated by proteolytic cleavage and reduction. Normally, TRAcP is highly expressed by osteoclasts, activated macrophages, neurons and endometrium during pregnancy. Expression of TRAcP is increased in certain pathological conditions such as Leukemic Reticuloendotheliosis (Hairy Cell Leukemia), Gaucher s Disease, HIV-induced Encephalopathy, Osteoclastoma and in osteoporosis and metabolic bone diseases. Anti-TRAcP antibody labels the cells of Hairy Cell Leukemia (HCL) with a high degree of sensitivity and specificity. 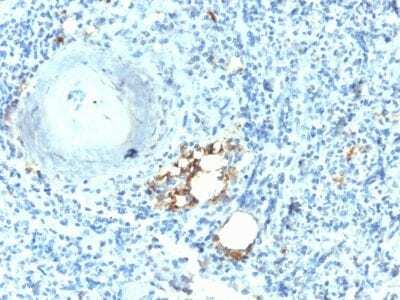 Other cells stained with this antibody are tissue macrophages and osteoclasts. Catalog number key for antibody number 2336, Anti-TRAcP (ACP5/2336R) The prefix indicates conjugation, followed by the antibody number and size suffix. Capeller, B., Caffier, H., Sutterlin, M.W. and Dietl, J. 2003. Evaluation of tartrate-resistant acid phosphatase (TRAP) 5b as serum marker of bone metastases in human breast cancer. Anticancer Res. 23: 1011-1015.